Chances are you’ve seen them as you’ve been driving around Dallas. Maybe you’ve been at an intersection, about to get on a nearby freeway, and you spot some cardboard or a backpack and a sleeping bag roll strategically placed under a bridge or perhaps you’ve even spotted signs of a village consisting of tent roofs nestled out of notice, in the blind spots we generally don’t notice while scurrying about the city. About 6,000 disenfranchised homeless people live on the streets of Dallas. Roughly 10% of these souls are chronically homeless. 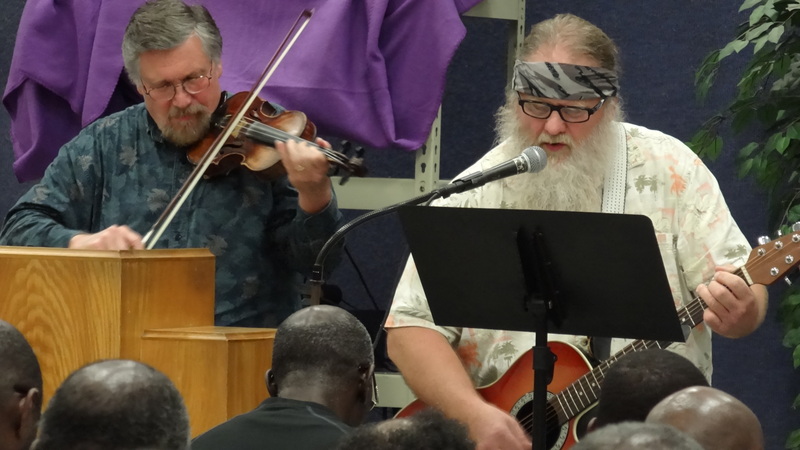 For over 65 years, Union Gospel Mission Dallas has faithfully ministered to the spiritual, physical and emotional needs of the last, least, lost and lonely in the Dallas area. Since 1949, the UGMD has helped the “tore up, busted and disgusted” (as one of their clients describes it) restore their lives. 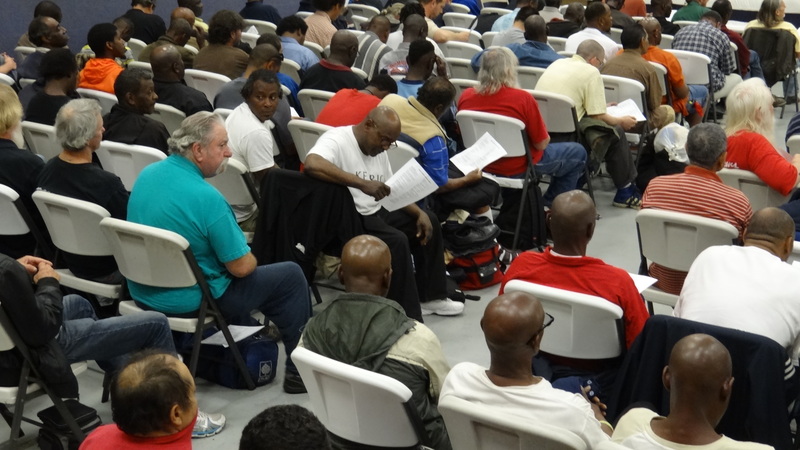 Every day destitute men and women are encouraged in their Christian faith and taught the necessary life and job skills needed to lead productive lives. Daily, children, of all ages, are given shelter from the hard life found on Dallas streets. Operating from three main facilities, UGMD provides shelter, meals, chapel services, showers, on-site clinics, and clothing. At Calvert Place, volunteers and staff serve over 25,000 meals every month. Their Discipleship Program, which takes a minimum of a year to complete, combines the basic services UGM provides with Bible study, counseling, life-skill classes, preparation for employment and job training. 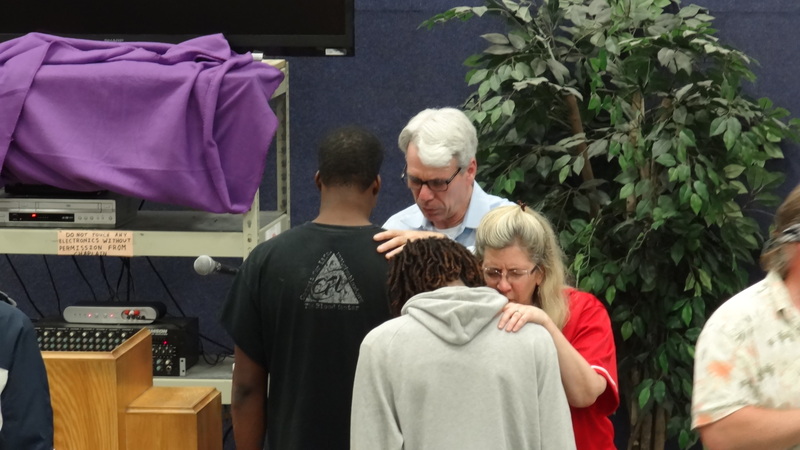 Upon completing the Discipleship Program, UGMD helps their clients find transitional housing. UGMD provides ongoing access to their trained counselors throughout the entire process from the time the client first enters the shelter to the time they take their first steps out on their own. 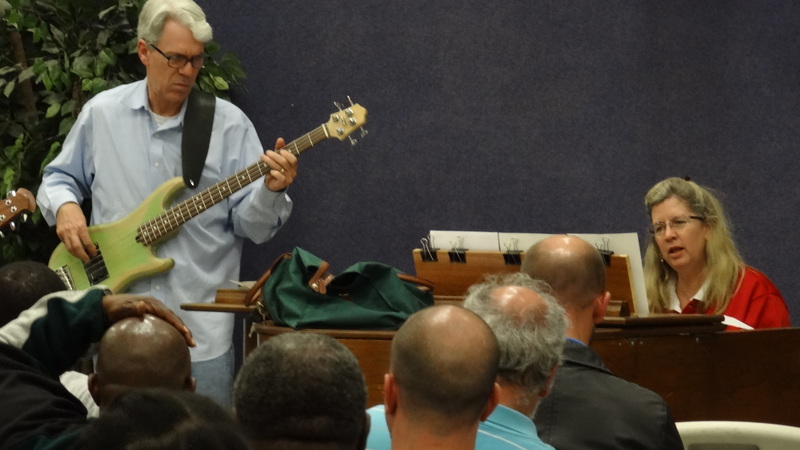 Beginning in 1963, Trinity Bible Church has ministered to the men of Union Gospel Mission. 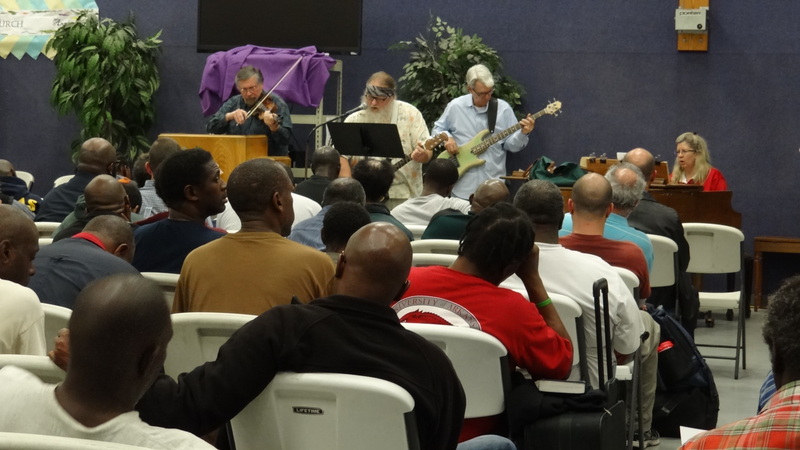 Every 4th Friday of the month, a group of us from church go down to the Men’s Shelter at Calvert Place and host a chapel service featuring music, speakers, a message from God’s Word, and prayer before the men gather together to share in a meal. 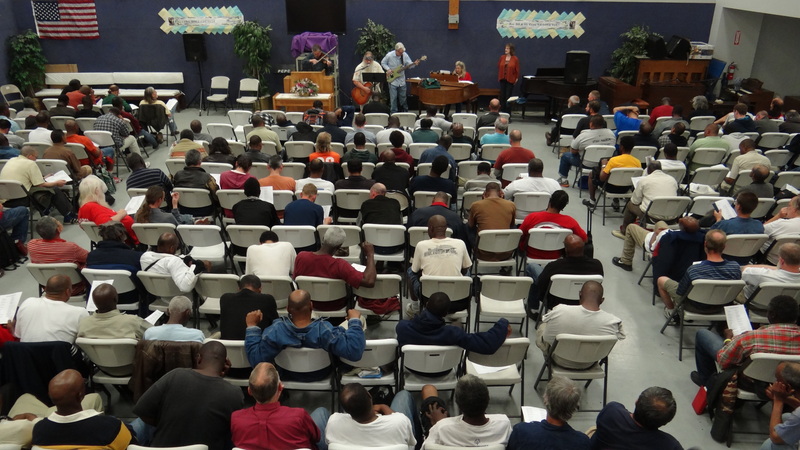 The Shelter hosts a nightly chapel service along with each evening meal. 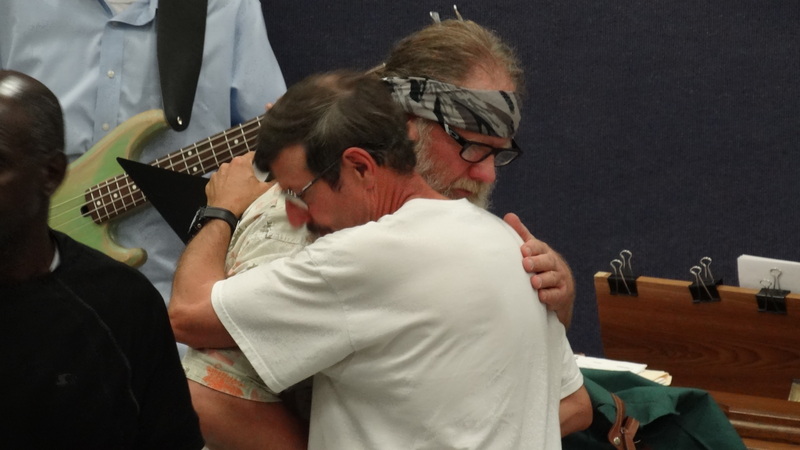 It has been a sheer joy for our band of brothers and sisters in Christ to spend time with these precious souls trying to find their way and get their lives back on the right track. Sadly, some of the people in our shelter are military veterans. In the catacombs of the different shelters serving these forgotten members of our society, you’ll meet guys who fought in ‘Nam and men and women who served in the First Gulf War as well as those who served in Gulf War #2. For whatever reason, when they came back home, they fell through the cracks, unable to get back to the “norm” of life. 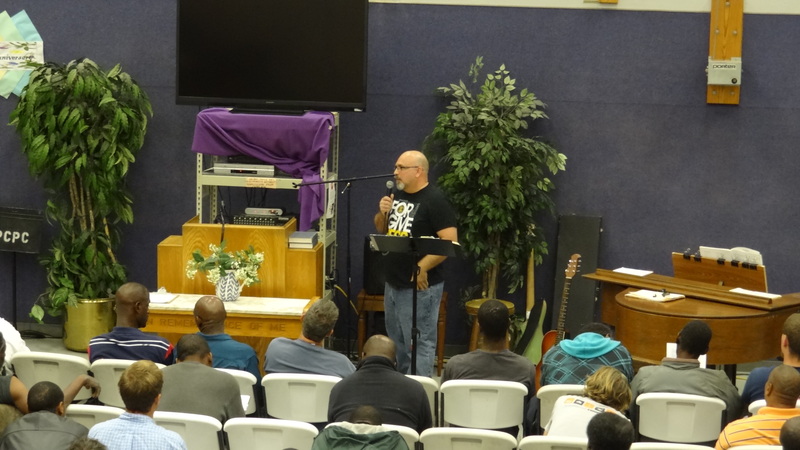 Some of the men I’ve come to know through our church’s 4th Friday outreach served time for almost every crime you can imagine and because of their criminal past find themselves cast out from society. Other men I’ve met, like me, battle addiction. The veil that separates us from them is thinner then we like to believe it is. But the truth is that a great majority of us live paycheck to paycheck and are only one impending disaster away from finding ourselves on the outskirts of society. Each time our group goes down to minister to these men, we strive to bring a message of hope and redemption. We offer encouragement to these men by letting them know they are loved and that they are valued. We sing with them. We share God’s Word with them. 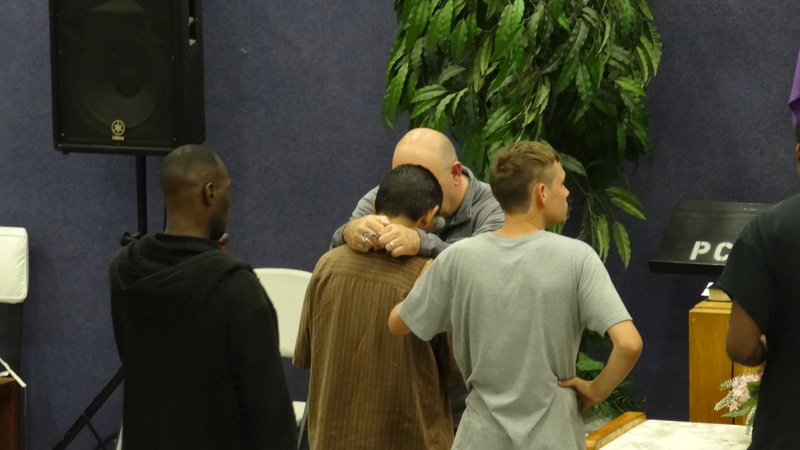 We pray with them, asking God to heal their hearts, their hurts and free them from their habits. At the end of our time together, they gather and share a meal cooked by the Mission’s staff and other volunteers. All of us that go there to minister to the people there feel immeasurably blessed and extremely challenged by our experience. It is incredibly rewarding to see the spirit and joy these men have in the midst of finding themselves in the most dire of circumstances. They choose to live life victoriously, in spite of their situation. It’s challenging for a multitude of reasons–for example, no military veteran who served our nation should have to live this way…there is just something extremely wrong with that picture. It’s challenging to see people who are hurting, regardless of what brought them there. Maybe it was something out of their control–like an unexpected disaster. Maybe it was something that got control of them–like addiction. At the end of the day, we do our best to encourage them to continue, as the Apostle Paul did, pressing on. Life deals us unexpected hands. It’s not a matter of if, but when. When it does, you can’t quit. You have to keep moving forward.